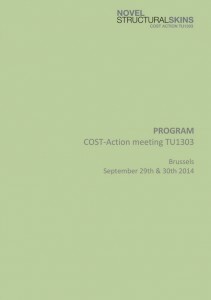 Download here the full program of the COST-Action meeting in Denkendorf on 24th and 25th March 2015. The meeting will take place on the ITV Denkendorf campus, Building C, second floor, Conference rooms 1-4. Unfortunately, Working Group 3 will not meet at the COST-Action meeting in Denkendorf . 18.45 Bus from ITV to location of conference dinner. * 1a: Adaptables group; 1b : Bending-active group; 1c: Fabric Formwork group. For other working groups, please visit this page. If you are coming by car and would like to have a parking space, please contact Casey Metcalf.